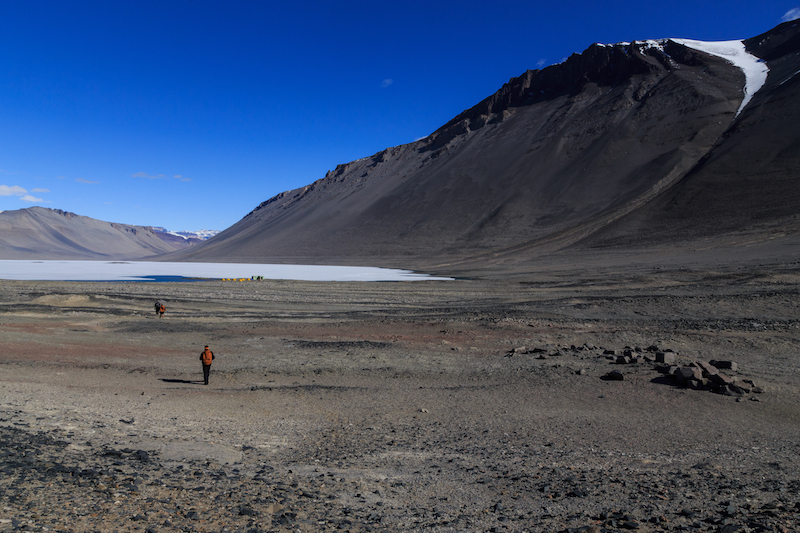 The McMurdo Dry Valleys (MDVs) are unlike anyplace I’ve ever been before. They are a combination of rugged mountains, similar to the highest peaks in the Rocky Mountains, and barren desert, similar to someplace like Death Valley. The valleys are completely bare of vegetation, other than very small algal mats. A few glaciers drain into the valleys from the higher surrounding ridges or from the Antarctic plateau at the head of the valleys. A small river, the Onxy River, flows through the valley and drains into Lake Vanda, where our camp is located. Onyx River flowing through Wright Valley. 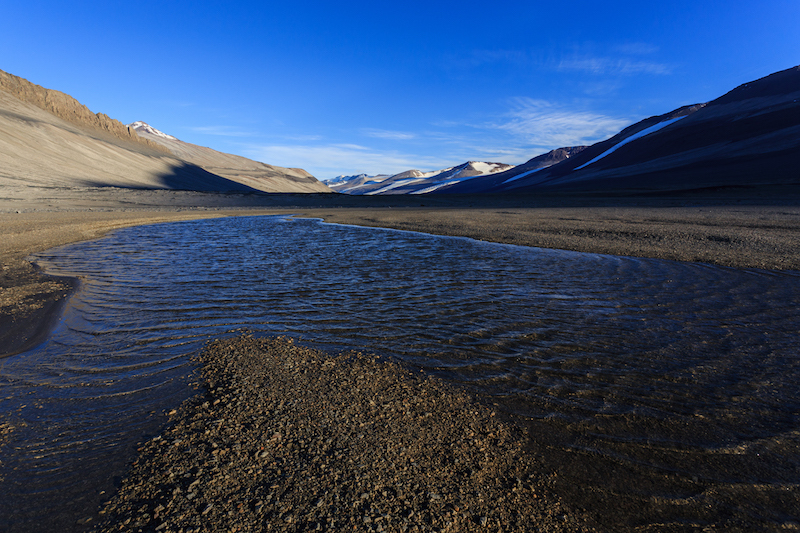 The landscape is dominated by sand and rock, with just a bit of snow, ice, and water. As a result the dominant colors here are varying shades of brown and black contrasting with the white snow and blue sky. It is a very big landscape and our camp looks quite small compared to its surroundings. Walking back to camp after a day’s work in the valley. The camp is just visible at the edge of the ice covered lake. The Wright Valley, like the other MDVs, was carved by a glacier, giving it a deep U-shaped cross-section, but is now mainly ice free. The Onyx River meanders through the center of the valley floor depositing sand along its banks, but gravity and rocks falling from the ridges on either side of the valley is one of the main geologic processes currently shaping the valley. Wind is the other main agent of erosion. Strong winds, in excess of 100 mph, can race through the valley picking up sand from the valley floor and sandblast everything in its path. 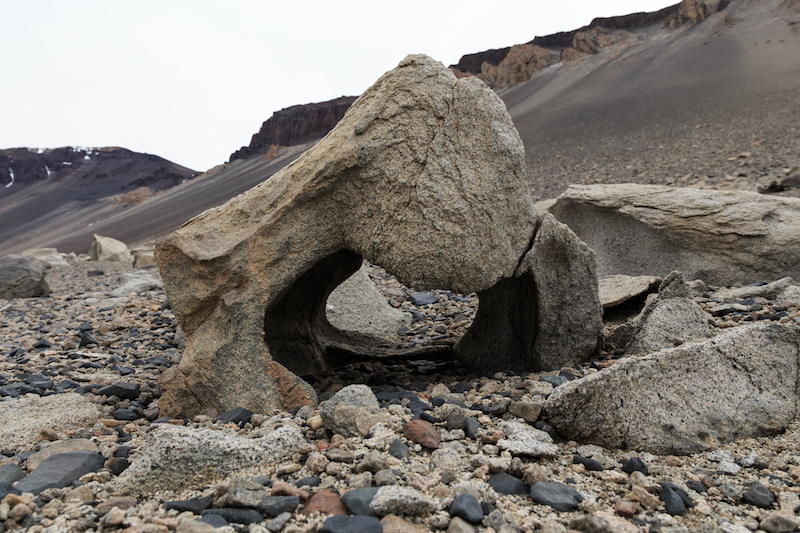 The result is fantastically shaped rocks, known as ventifacts, that have been carved by thousands of years of sandblasting. A ventifact near Vanda camp. The strong winds blow from right to left in this photo and have created a smooth, aerodynamic upstream edge to this ventifact. Not all of the ventifacts I’ve seen have this smooth aerodynamic shape. Many of them have oddly shaped depressions and holes carved into them by the turbulent wind. Here I am posing next to a large ventifact on the valley wall above our camp. Last Saturday the weather wasn’t ideal for doing our unmanned aircraft flights so I took a long hike, with one other person from camp, along the shore of Lake Vanda. Our camp is on the east end of the lake and we hiked past the west end of the lake – about 6 miles from camp. 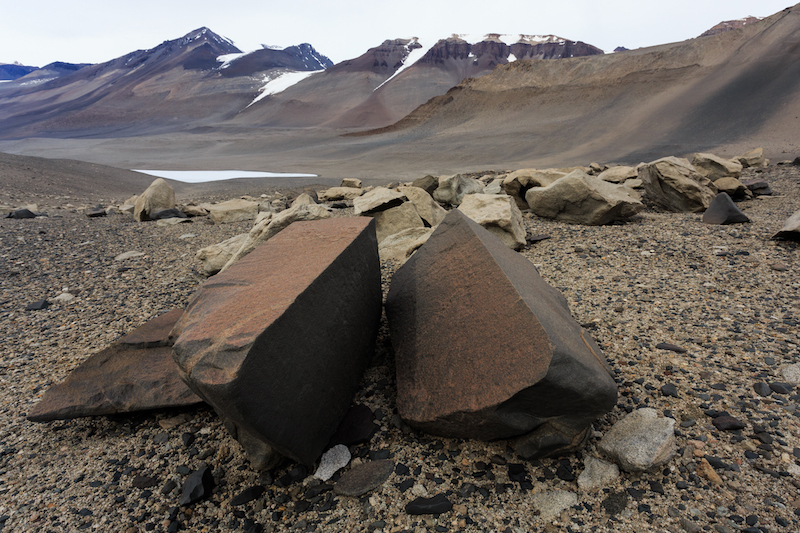 Throughout the hike we saw lots of ventifacts on the sloping valley wall above the lake, but at the far end of our hike we came to a small pass in the valley that was littered with oddly shaped ventifacts. A ventifact just beyond the west end of Lake Vanda. Strong winds have blown away most of the sand from around the base of this rock and at the same time this windblown sand has carved two “fangs” into the rock. 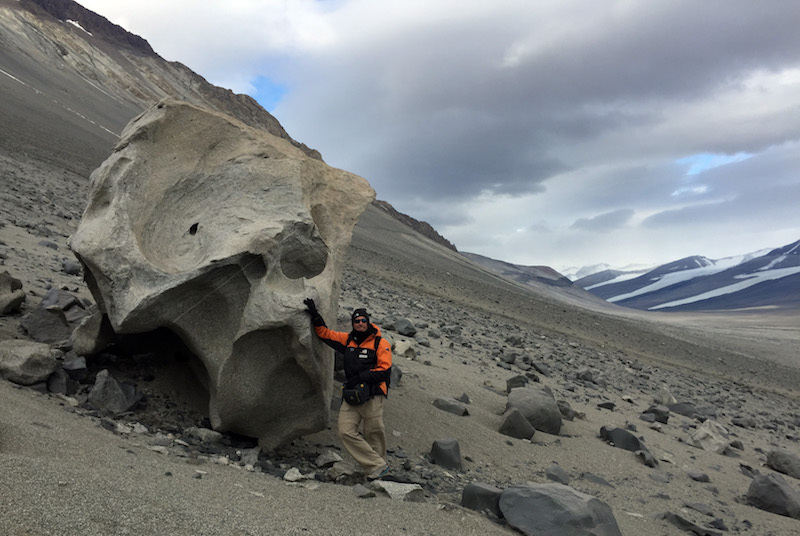 The windblown sand has hollowed out the bottom of this boulder. 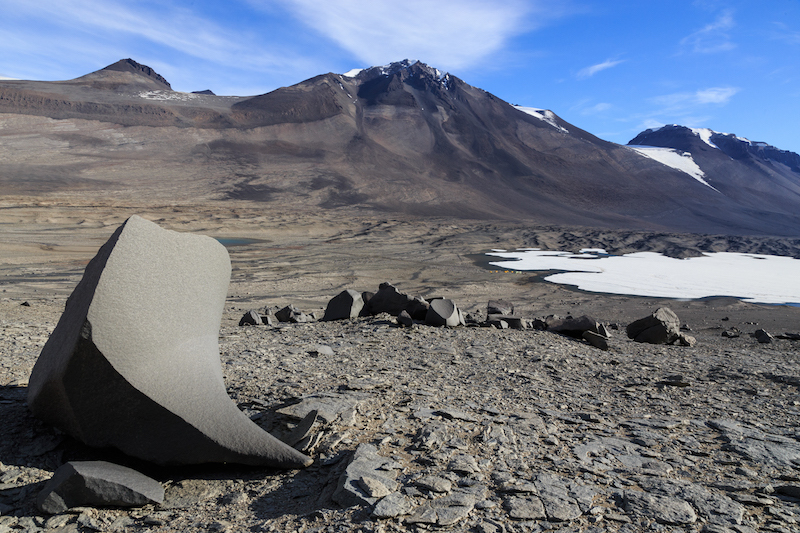 The strong winds blow away much of the sand in the valley leaving behind a “pavement” of small pebbles on the surface that can be seen in the photos above. In addition to the many ventifacts we saw during our hike I also noticed quite a few rocks that looked as though they’d been sliced in half by a giant knife. When melting snow seeps into a pre-existing crack in the rock and then refreezes the ice that forms expands and widens the crack. Eventually the rock splits under the force of the continual melting and refreezing of ice in the crack. 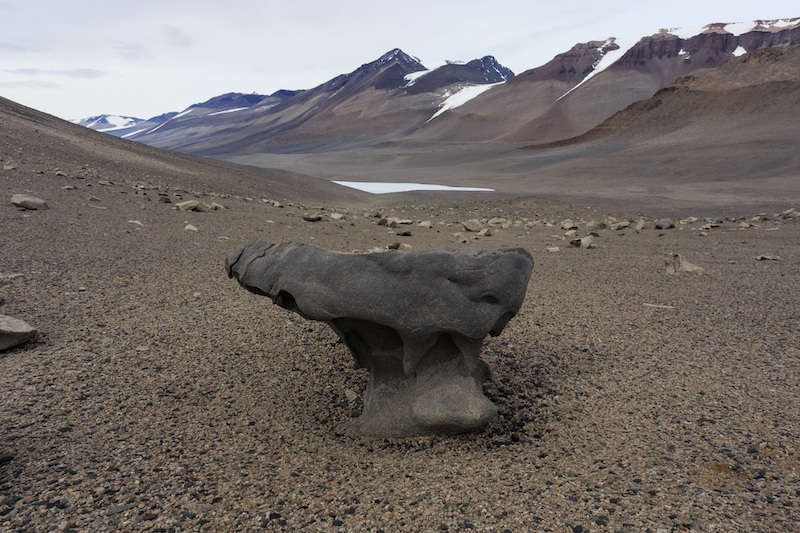 A split rock above the west end of Lake Vanda. 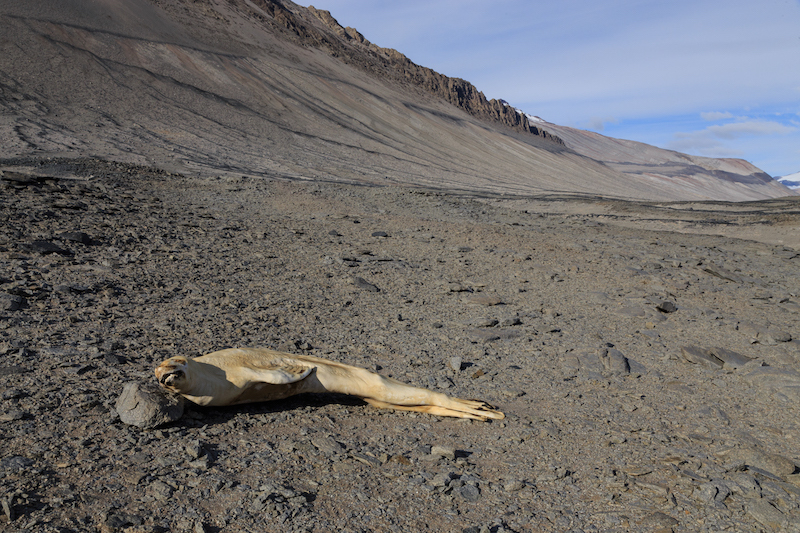 The valley is largely lifeless, other than some microscopic plants and animals living in the lake and river, but occasionally a seal from McMurdo Sound will wander into the valley. I came across this mummified seal while hiking near camp. This seal had to travel over 10 miles through the dry valley to get to this location. It is still a mystery why seals come so far into the MDVs where they ultimately die and are preserved by the cold, dry environment. Mummified seal in Wright Valley. In my next blog post I’ll talk about the drone flights we’ve been doing. These are amazing pictures – I have never seen anything like this! Looks like a science fiction landscape, really. Thanks for posting this. That is a perfect way to describe it. I couldn’t help feeling like I was on the set of a Star Trek episode when I was walking around the valley. Wow, this looks like on another planet. I would love to go there one day. Amazing pictures. I just set up first picture to my desktop. Number 3 is also amazing! Wow! this is amazing pictures. This landscape, though a bit rocky, is beautiful. I can’t wait to read the drone flight post and to see the aerial pictures taken. Can i use these pictures on a fb group? Yes, feel free to use these pictures on a Facebook group, although I’d appreciate it if you could include the blog address when you post them.